In October, I predicted that real GDP would not fall below $11 trillion year 2000 dollars. So far, that's been right. If real GDP drops below $11 trillion, that would be a real GDP decline that is slightly worse than the 1981-82 recession. I was wrong about employment, though. BLS will release productivity next Thursday, but the BEA release today suggests no productivity surprises: productivity similar in 2009 Q1 to what it was in 2008 Q3 and 2008 Q4. That's not especially good news, because productivity might be expected to rise when labor falls so much. But may it is good news in that, even it its worse quarters, this recession not yet shown total factor productivity declines as severe as the 1981-2 recession. 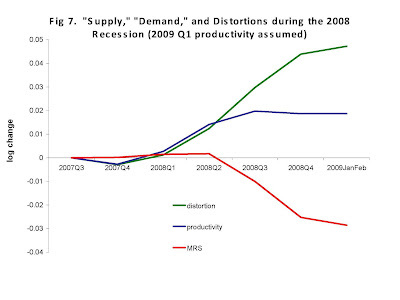 Below is a chart (I made this for my World Bank presentation two weeks ago) decomposing the labor changes in this recession into supply changes and distortion changes. I post in now because it fits very closely with the BEA's release this morning. The MRS series says that labor supply stopped shifting out (consumption declines have stopped), which means that "distortions" (green series) had less of a role in reducing labor than they did in previous quarters. My productivity approach to forecasting 2009 Q1 real seasonally-adjusted GDP said that it would be 1.5 percent lower than 2008 Q4. Today the BEA reported that (according to its advance estimate) 2009 Q1 was 1.57 percent lower than 2008 Q4. [If you are wondering why the headlines about the BEA report say -6.1 percent, see here]. My spending approach was more optimistic, because I did not see any evidence of a significant real consumption decline. The BEA agrees with me on that too: it says real consumption expenditure ROSE 0.53% from 2008 Q4 to 2009 Q1. 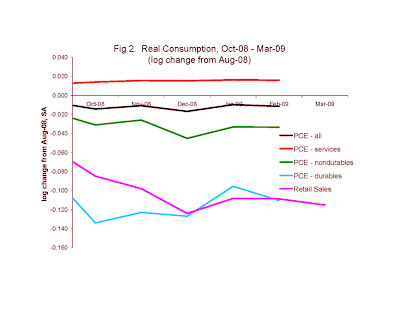 It says that real consumption spending increased in every one of the three major categories, especially durable goods. The big surprise for me is that, according to BEA, nominal and real nonresidential structures investment fell MORE than residential structures investment did. I don't see where they get the evidence for that, given that (at least through Feb) the Census Bureau's measure of nominal non-residential construction spending had declined at half the rate that its measure of residential construction spending had. The world is watching the outbreak of a very serious swine flu. Although the disease is a medical condition, the spread of contagious diseases among humans is an eminently economic phenomenon. Back in the 1980s, scientists were educating the population on the seriousness of the spread of the H.I.V. virus. H.I.V. is passed among humans, and scientists thought H.I.V./AIDS would spread to a large fraction of the populations in the United States and elsewhere as more people contacted greater numbers of persons carrying it. Indeed, at that early stage scientists had already observed exponential growth (that is, growth at ever-increasing rates) of H.I.V./AIDS prevalence. However, the medical community’s 1980s consensus on the future of H.I.V./AIDS prevalence was at odds with economic theory. Professors Tomas Philipson and Richard A. Posner at the University of Chicago pointed out that people consider — and sometimes take — steps for protecting themselves against contagious disease. In particular, prevalence — the portion of the population that is affected by a disease at a given time — is a key factor people consider: When a contagious disease is less prevalent, fewer people will take steps to protect themselves, and their lack of protection will help the disease spread. When the disease is more prevalent, more people will protect themselves, and their efforts will help thwart the disease’s spread. In other words, while the medical community was using exponential growth to forecast the future of H.I.V. prevalence, Professors Philipson and Posner said that H.I.V./AIDS prevalence would follow a cycle: first rising, then falling. A lot was at stake: If the exponential growth forecasts were right, the public sector might reasonably consider spending trillions trying to fight the disease. A similar prevalence pattern among humans is likely to be true for the swine flu. The initial spread of the disease among humans occurred when precautions were low. Now that we know that the disease is spreading, private individuals and corporations around the world have already taken steps to protect themselves, and these steps will eventually help slow further spread of the disease. Individuals and corporations try to protect themselves and their employees, but they do not have good incentives to protect others. For this reason, government assistance can be valuable, and help make the disease cycle occur with a lower and less costly peak than it would with private actions alone. Nevertheless, government efforts have the effect of reducing private efforts. The private sector does less to prevent a disease’s spread when the disease is less prevalent, and government assistance can help reduce prevalence, so government assistance will likely cause the private sector to do less to prevent a disease’s spread. This is a special type of the “crowding out” that happens with many kinds of government spending. The swine flu may soon present our government with some tough choices: how many tax dollars to spend and how much to interrupt civil liberties. The public and taxpayers will benefit if those choices are sensitive to the critical role played by the private sector. Professor Goolsbee wrote that research subsidies do not create research, they just raise the wages of scientists. Now some Obama opponents are using Goolsbee's result as a critique of Obama's policy to significantly subsidize research. This is not a valid critique of Obama's policy, because Professor Goolsbee was wrong. Professor Goolsbee (incorrectly) thought that scientifically-trained labor (that is, people trained to do, and actually doing, scientific research jobs) is inelastically supplied in the aggregate, so that public subsidies just reallocate scientists from the private sector to the public sector [this is the crowding out issue at an occupation level: crowding out is real, but at that level cannot be one-for-one]. Scientifically-trained labor talent is SURELY elastically supplied in the long run. Even over the span of a few years, scientifically-trained labor may be elastically supplied. The late Professor Sherwin Rosen and Chicago alumnus Jaewoo Ryo showed that "and enrollment decisions are remarkably sensitive to career prospects in engineering." Even if the scientifically-trained labor were elastically supplied in the long run and inelastically supplied in the short run, public subsidies would still increase the aggregate amout of research. The only exception would be that policy makers were able to make students expect no subsidy when they chose their occupation (thereby eliciting no additional supply in the long run) but then later surprising them by actually paying one, and in the process failing to create an expectation of future subsidies. The valid reason to oppose Obama's policy is that politicians and government bureaucrats are poor judges of how scientists should spend their time. Sean MacLeod (smacleod@metacapital.com) sent this -- thanks! 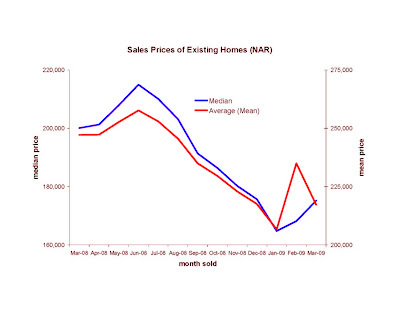 Yet two more series come from NAR and show an increase Jan-Mar. I think it is safe to say that, contrary to 2008, housing prices are falling gently enough in 2009 -- if at all -- that more than one house price measure cannot detect it. While the OFHEO index increases almost everywhere, the Case-Shiller index declined Jan-Feb in every single city measured. On this blog, we have considered various reasons why the two indices would be different. But I cannot honestly say that we have an explanation for the two indices' disagreements over the past few months. For example, Professor Nunes pointed out that Case-Shiller puts a lot of weight on the more expensive housing areas. But now Case-Shiller and OFHEO disagree on a region-by-region basis. Whom Do You Believe: Me or the RPX Forwards? "I spent last year working in credit research at a large MBS hedge fund and as part of my job I investigated the RPX index, meeting with representatives of their company at several conferences. In summary, I would be very suspicious of numbers coming from their index. Their methodology is quite strange and at least as of 10 months ago trade in the contracts was very light making the predictive power of the futures prices suspect. On the plus side, at least historically their index tracks Case-Shiller quite closely. However, their index is substantially more volatile. Their index is based on the distribution of price-per-square- foot transactions in a given region over a given time interval. They do not differentiate between new and old housing stock, so their index is not constant quality. Further, they report that their index is computed daily or monthly, but given the frequency with which transactions databases are updated this is not possible. I suspect they just use whatever data they have as of certain date, which means heterogenaity in county reporting speeds can bias their index." Either way, it is still cheaper to buy a house via RPX (if you can do that) rather than from an actual homeowner. Feeling safe is often more tangible than actually being safe, which is why you should not read this article about protection failures at all levels of government. "The market for RPX forwards does not seem to reflect the strength observed in the housing markets. 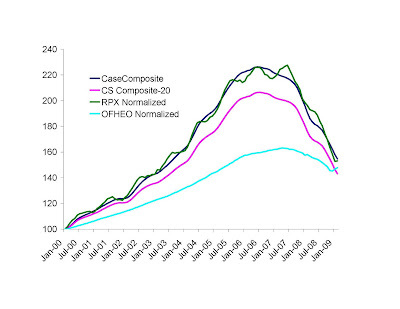 Forward prices imply a 23% decline in the 25-MSA RPX Composite by the end of 2009." I don't know anything about the details of the RPX market operations, but it seems that it is cheaper to buy a house via RPX than to purchase an actual house. The way I see the data on new home sales (below) and home prices from various sources (here and here), the 2009 housing market is not crashing like the 2008 housing market. Someone asked why I think that home prices were due to stop crashing in early 2009, and what I thought would happen to housing prices in the longer term. The simple answer is that housing construction cannot remain as low as it was at the end of 2008, because the population continues to grow (and incomes will grow again, too). If housing construction is to rise to more normal levels, the profits from housing construction must be better than they were at the end of 2008, which means that housing prices (more specifically, housing prices expected to prevail at the end of the construction project) have to be higher or construction costs lower (notice that most of my housing price graphs are expressed as a ratio to construction costs). Moreover, I thought (and still think) demand will catch up with supply sometime this year. So that's why I thought housing prices would not continue to crash in 2009. In the long term, housing prices (expressed as a ratio to construction costs) may be a bit lower than they are now. But we could well get to that long run outcome via a short run price increase. For the details of that possibility, you have to wait for the release (sometime in May) of my next housing supply paper. This recession has demanded a lot of us economists. Luckily Professor Summers is smart enough to know what people are saying without actually being awake to hear it. See the chart below, which is based on a different methodology than the OFHEO index I showed yesterday, and goes through March. The housing boom is acknowledged largely because housing was accumulated at a faster rate 2002-2006 than it was in 1990s. Maybe less recognized is that real per capita incomes grew 0.8% less per year 2000-2008 than they did in the 1990s. Population grew 0.3% per year less. Based on these factors alone, housing demand needs to increase 7% more in order for housing prices to stop falling. This could take a while. However, I believe that there were at least some fundamentals other than income and population driving the housing boom, and those fundamentals persist today. Especially important is information technology, and its effects on the banking and real estate industries. Thus, from a theoretical perspective, it is possible that housing prices have already finished falling. 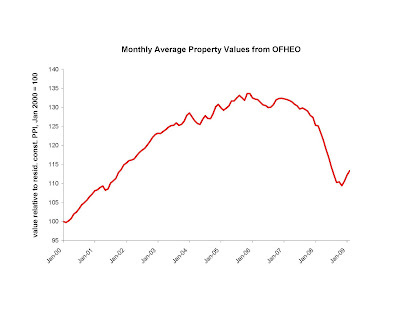 Interestingly, the OFHEO (now called the FHHA) released its price index for February. 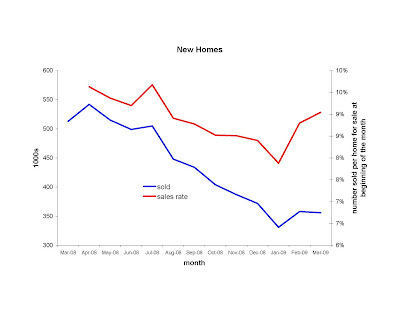 It shows that housing prices increased Jan-Feb, after an increase Dec-Jan. According to OFHEO, housing prices even increased in the Pacific and Mountain regions. As noted by several commenters, the OFHEO index and the Case-Shiller index do not always agree. Nevertheless, it becomes more and more difficult to argue that housing prices and construction are falling in 2009 the way they were in 2008, and easier to argue that the housing market has hit bottom. When Will Housing Construction Resume? A housing bust got this recession started, so it is important to know when housing construction will resume at a normal pace. However, important determinants of housing demand have moved in opposite directions, so a housing recovery could be as close as this summer, or as far as 2011. The release later today of the House Price Index from the Federal Housing Finance Agency will provide insight into the relative likelihood of these scenarios. The black line in the chart below shows an index of housing inventory per person at the end of each year from 1990 to 2008 (with housing inventory measured as square footage, adjusted for quality). Housing almost always increases faster than population, but the housing boom of 2002-06 stands out compared to the other years in terms of the relative rate of housing construction. Housing construction will resume when housing demand exceeds housing supply. But that raises the question: What will happen to housing demand? 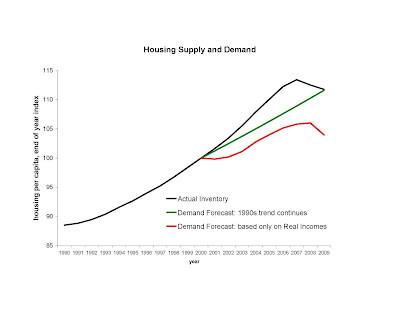 One simple housing demand forecast is to assume that housing demand will return to its 1990s trend, shown as a green line in the chart. This approach suggests that housing demand would match supply — and therefore housing construction would resume more normal rates — by the end of this year. However, several things have changed since the 1990s, and are not likely to return fully to their 1990s situation. There have been two recessions since 1999, which will leave 2009 family incomes about 6 percent below the 1990s trend. Presumably housing demand grows more slowly when incomes grow more slowly. Based on the income growth alone, it looks as if housing demand would be 7 percent below supply (104 rather than 112) at the end of 2009 (see the red line in the figure), and that the excess supply of houses will be at least as much this year as last year. According to this approach, it could take until the end of 2011 for housing construction to resume, and for now housing prices would continue to fall sharply. Although the banking and real estate industries have received deserved attention for their failures, they have also succeeded in some ways since the 1990s, and those successes will not be erased. Information technology has advanced, and can help lenders assess borrowers’ ability to pay, as well as help home buyers search for a home and for a mortgage. Thanks to this progress, housing demand might be able to stay above the trend of the 1990s. The housing boom may have left some homes in the wrong places, such as Arizona, California, Florida, and Nevada. If so, then housing demand may soon catch up with supply outside of these areas, while housing long remains depressed in them. The national total of housing construction could therefore resume earlier. The housing market itself shows a few signs that prices and construction are not falling as they were in 2008. After declining several months in a row in 2008, housing starts in February and March 2009 are above what they were to begin the year. Pending home sales increased in February. After falling 10 months in a row, the House Price Index rose 1.7 percent from December 2008 to January 2009 (not surprisingly, housing prices continued to fall in the Pacific region). Thus, the release later today of the office’s measure of February 2009 prices is of significant interest. If it fell more than 2 percent from January, this suggests that the 2008 rate of decline continues and 2009 may not be a year when many new homes are built. Otherwise, we have more support for the conclusion that the 2008 housing crash is largely finished (for now) in most of the United States, and that the next step is for resumed housing construction. In principle, U.S. citizens are free to run for office. But that doesn't mean that running for office is free! He says "The harder [running for office] is to do -- in terms of time, fundraising, personal disclosure, and poor pay -- the fewer quality people we should reasonably expect to do it. " "Gerontocracy, Retirement, and Social Security"
"The Extent of the Market and the Supply of Regulation"
I have looked at two approaches so far, and find myself pretty close to the consensus (of -1.3% = -5.1% SAAR). 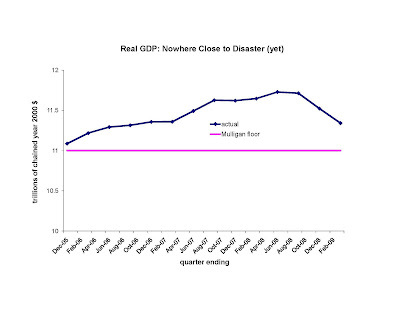 To put this in perspective, I am predicting that real GDP 2009 Q1 will be about $45 billion in less than 2008 Q4 in aggregate, or $150 per person. This is on top of the $230 per person lost in 2008 Q4, for a grand total of $610 lost per person in the last two quarters. Productivity Approach (assumes that the Labor Productivity Residual declines about like it did Q3-Q4): Real GDP is 1.5% lower in 2009 Q1 than 2008 Q4 (SAAR = -6.0%). Spending Approach (uses existing monthly data on consumption, construction, and government payrolls): Real GDP is 1.0% lower in 2009 Q1 than 2008 Q4 (SAAR = -4.1%). Perhaps the biggest surprise is that 2009 Q1 real consumption is not much different than it was in 2008 Q4. When combined with the fact that government payrolls have not shrunk (private consumption and government purchases comprise the vast majority of total spending), it's difficult to predict that spending will fall much. 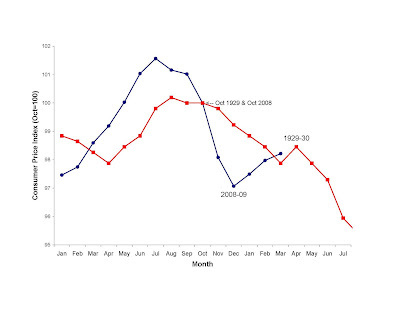 Housing starts declined several months in a row in 2008. In 2009, February and March were higher than January, although March is below February. This blog is based on the premise that we have the tools (esp. the tools of supply and demand) to understand what has happened in the economy, and what will happen. even if the "complex securities" like CDS's are complex, they are no more complex than securities that have existed for centuries, such as equity in non-financial business firms. The BLS reported this morning that seasonally adjusted consumer prices fell 0.1 percent Feb-Mar. They rose 0.2 percent without the seasonal adjustment. -0.1 percent is not enough to offset the -1.1 percent decline (Feb-Mar) in retail spending (reported yesterday): the real volume of retail spending in Mar was undoubtably lower than it was in Feb. Here is the comparison with the 1930s (both series are seasonally unadjusted because the 1930s seasonal adjustment is not available). Partly because the Social Security tax takes so much from taxpayer wallets and because it is less visible than the individual income taxes, some Americans get themselves into trouble by neglecting to pay all of their Social Security tax. Before his confirmation as Treasury secretary, Timothy F. Geithner himself was embarrassed in January when it was revealed that he had neglected to pay Social Security and Medicare taxes for several years. Over the years, other senior civil servants have also been embarrassed by revelations that they’d failed to pay Social Security taxes on household help (including acommissioner and an acting commissioner of the Social Security Administration). The PPI for residential construction fell in March about like it did in February (less than one half of a percent), which is a lot less than what happened in the months of 2008. The PPI-SOP for construction actually rose a bit in March after rising in January and February. The PPI fell in March, to a level lower than it has been since 2007. It is 8 percent below its peak last summer. It is 1.2 percent below February's PPI. Retail sales (measured in dollars) fell 1.1 percent from February. However, the volume of retails sales might have been pretty constant if the CPI fell anything like the PPI did. http://www.bls.gov/ will let us know about the CPI tomorrow. Some inflation-adjusted consumption decline Jan-Mar is to be expected, given how poorly the stock market did over that time. So if inflation-adjusted March retail sales are ultimately flat, I view that as good news, although I would like to see prices stop declining. Today Reuters reports "IRS agents were given more flexibility in their collection actions, including the ability to reduce or suspend monthly payments on back taxes so those hit hard by the financial downturn are not forced to default on their tax payments." In plain language: the IRS will give you a payment reduction ONLY if you demonstrate if your income is low. I explained in a number of previous posts (here, here, here, here, here, here, here, here, and here) how when mortgage debt collectors offer forgiveness, but only for persons with incomes that are low in comparison with their debts, that creates financial disincentives for working. You might guess that the economics is much the same for tax debt collectors: when they offer forgiveness, but only for persons with incomes that are low in comparison with their debts, that creates financial disincentives for working. That's why I call that new IRS policy a marginal tax rate hike, even if the result is to reduce tax collections. 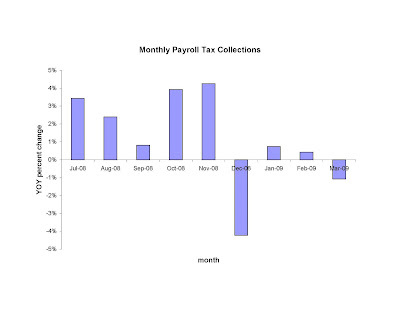 The chart below shows payroll tax collections through March 2009. They are expressed as a percentage change from the same month in the prior year. As compared to the same quarter in the prior year, 2008 Q4 payroll tax collections fell 4 percent. 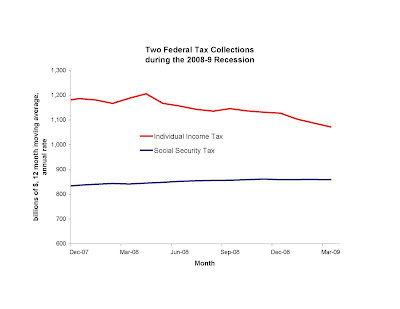 As compared to the same quarter in the prior year, 2009 Q1 payroll tax collections fell 8 percent. This is one indicator that the contraction of payroll spending in Q4 continued at about same pace in Q1. It is reported that Goldman Sachs will issue common stock to repay their TARP loan. It is neither a coincidence nor a surprise that Goldman issues shares at the same time that they repay their TARP money. I explained last fall how Treasury "capital injections" just result in greater payments to bank industry shareholders. One (of many ways) it could work is that a bank receiving TARP money would either buy back its shares (or buy, for cash, shares of competitors), or use the Treasury funds to forestall raising new capital that (thanks to the recession and housing crash) would have been necessary. The same argument implies that payments from a bank TO the Treasury would reduce payments from banks to bank industry shareholders (or increase payments from shareholders to the banking industry). That's what we see with Goldman's new issue. Politicians told us that TARP money was actually going to be lent to bank customers, rather than paid to shareholders -- they were wrong. For more examples, see my posts under the "bailout" label. Subsidies can have a perverse effect on activity if they are debated too long. The banking sector bailout is one example; the purchase of hybrid automobiles by Chicago cab drivers is another. Hybrid automobiles can save gas, especially in urban driving conditions when the automobile is moving slowly or idling, when alternative power sources have a bigger advantage. A problem is that the purchase price of hybrid vehicles is often higher, and many are less spacious than the more ubiquitous sport utility vehicles. A significant fraction of the taxicab fleet may be well suited for hybrids, because many of the miles driven are in urban conditions, and often the vehicles have only one passenger. Thus I have been surprised to notice so few hybrid taxis in Chicago, where less than 1 percent of cabs are hybrids. In an admittedly unscientific survey, I watched for Toyota taxis with about 100,000 miles. I assumed that many drivers of Toyotas would be likely to buy a Toyota for their next taxi, and that the Prius — the company’s hybrid model — would get their consideration. I asked the drivers about buying a Prius. The drivers told me about the Chicago City Council’s debates about transforming the city’s taxi fleet. The council has debated mandating hybrid purchases. But the rumor among taxi drivers is that in addition, or perhaps instead, the city or other government agency will eventually subsidize the purchase of a hybrid. Drivers have decided that they should not purchase a Prius or other hybrid until the subsidy arrived. Buying one now would mean over-paying. Regardless of whether it is realistic to expect Chicago to someday subsidize purchases of hybrid taxis, the fact is that some cab drivers are considering the possibility. If taxi drivers consider future subsidies in their industry, then so must bank executives. Last fall the public learned that banks were not selling many of their legacy mortgages and mortgage-backed securities, despite the impression that ownership of the assets were hindering the banks’ lending. A variety of theories have been put forward to explain this failure, and to suggest what the government might do to fix it. But the lack of trade in mortgage-backed securities may have something in common with the lack of trade in hybrid Chicago taxicabs. The secondary market for legacy mortgages may have stagnated largely because of the (ultimately correct) anticipation of a huge government subsidy. As I wrote last week, banks were not “unable” to sell their legacy mortgages; they were prudently unwilling to sell because they expected the government to eventually step in and help push the prices of the assets higher. There would have been two preferable possibilities: for the government to come forth quickly with its subsidy, or make it clear from the beginning that no subsidy was coming. With both Chicago taxis and the secondary market for mortgages, the government did neither. Instead, it only fueled rumors that subsidies were on the way, and froze the same markets it intended to stimulate. I learned a new word today from the Office of Thrift Supervision: Home Retention Action. A Home Retention Action is change in a borrower's monthly mortgage payment (contrary to the loan's original terms) with the supposed purpose of getting the borrower to remain in his home rather than walk away from the home and mortgage. I have referred to this as "loan modification" but OTS explains that some payment changes are technically not "loan modifications" because (many of?) the loan's original terms are still in place. From a conceptual point of view, it hardly matters how a payment is changed is labeled, but rather the determinants of whether and how much of a payment change occurs. In their study of 32 million mortgages, more than one million home retention actions occurred during 2008. Some of these may be multiple actions on the same mortgage, but as a rough approximation three percent of mortgages had a home retention action in 2008. I have suggested that a significant amount of non-employment in 2008 is due to the anticipation of modifications (some of which would occur in 2009). The Obama Administration would like to see about 9 million home retention actions. Housing construction spending continued to decline in February, which contradicts much of the other (starts, prices, and sales) data suggesting that the housing market may have hit bottom. Also reported today was a February increase in pending home sales. 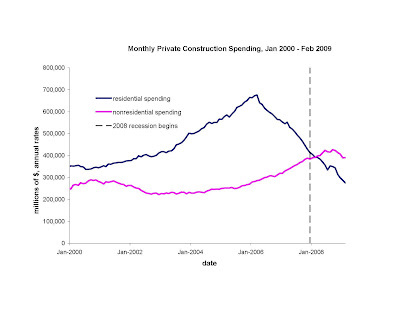 Interestingly, non-residential construction stopped its brief decline, and remains higher than it was at the start of the recession and dramatically higher than it was during the housing boom. Banks own mortgages (either directly, or through ownership of mortgage-backed securities) whose values plummeted in 2008, because the mortgages are collateralized with real estates whose values crashed. As United States Treasury Secretary Timothy Geithner says, a secondary market for mortgages “does not now exist” because there is a “lack of clarity about the value of these legacy assets [which makes] it difficult for some financial institutions to raise new private capital on their own." But let’s stick with the conventional wisdom for a moment more. According to that wisdom, it does not help for the Treasury and the FDIC to subsidize and leverage the purchase of legacy mortgages from banks as Secretary Geithner proposes, because the plan does nothing to (a) create clarity in legacy asset value or (b) ensure that banks no longer have significant direct or indirect holdings of mortgages on their balance sheets. To make matters worse, the Geithner plan has no provision to stop banks from funding some of the ventures that will purchase the banks’ own legacy assets. The result may be bank ownership of mortgages that is less direct, but ownership nonetheless. But I believe that the conventional wisdom is highly exaggerated. Instead, the secondary market for legacy mortgages has stagnated largely because of the (ultimately correct) anticipation of a massive government subsidy. Banks were not “unable” to sell their legacy mortgages; they were prudently unwilling to sell because they expected the government to eventually step in and help push the prices of those assets higher. We all witnessed last week the massive capital gains to banks that came with the unveiling of the Geithner plan. A bank would have been foolish to sell off its legacy mortgages during the fall or winter, before such a plan was unveiled and executed, because a fall or winter non-bank buyer of legacy mortgages would likely be ineligible for the ultimate subsidy. Thus, the secondary market for legacy mortgages has failed so far due to the lack of a plan rather than a lack of clarity. In order to get the market operating again, the Geithner plan does not need to alleviate the market weakness improperly identified by its authors, but only needs to stay on the path to execution.